She finished one of the twenty different craft totes that we started to make while I was home in April. I choose all the fabrics (it was so fun to mix and match) and quilted them on the sewing machine – but mom had to finish them. The pink and rose tote was for me. I think it is super cute. 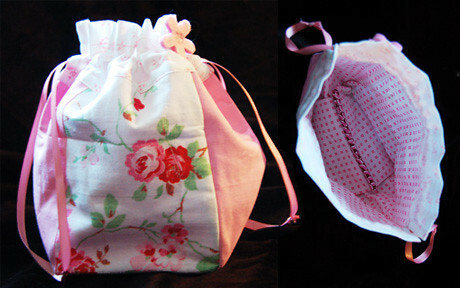 Some of the other craft totes will go up in the shop as soon as we can take photos of them. She also made a cute paper bag with glitter text that reveals the name of our shop to be! This post contains some random photos of stuff that I’ve ordered, bought or recently gotten in the mail. Getting surprices in the mail or things you’ve ordered online is great fun, right? When buying stuffing for my softies I bought a very small piece of green fake furr fabric! The colour stings your eye, and I love it. I think it will be fun to use in future projects that I’m planning. 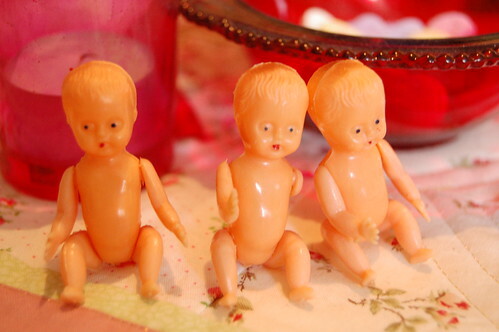 The ugly and scarry triplets comes from a seller at Tradera. I didn’t know they would be so scarry, they didn’t look it at her picture! But maybe I can make something arty that is also scarry with them? When I have no money I treet myself with gifts… Like this gel pens in a pack of 48 or something for about 100 SEK from Clas Ohlson. 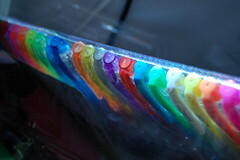 I like this picture, but some of the pens doesn’t even work. I like the smelling glittery ones best, they write well. On the package it said: Take writing to the x-treme! So fun! How about this crafty fun? After reading about the online shop Alpha Stamps at Tracys great site Artsy inspiration I got caught by the great stuff and bought a little package from the states. I didn’t wait long, but for the “delay” the shop owner send me some extras too. I can really recommend shoping at Alpha Stamps! But schyy! 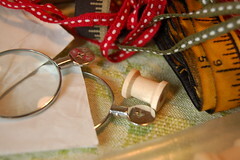 Some of the measure ribbon, and all of the very tiny and naked spools of thread. Mothers day in Sweden is next Sunday! Also got Portals, the zine, this month. 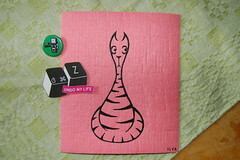 Had one nice article on how to make backgrounds with paint by Kelly Angard, but not much more that I thought was for me. Also recived, in a trade, two beautiful pieces of art money from Hanne in Denmark. Love them, and Hannes beautiful letters. Thrifted blank book that I will do cat notes in. It’s a hologram cover! This is the three things we got at the Design market, that I will write more about when I can. It’s a button that says I love my camera, a pink Ylva desined dish cloth with a cat printed on it and P’s find; a magnet that says Undo my life in Apple language. 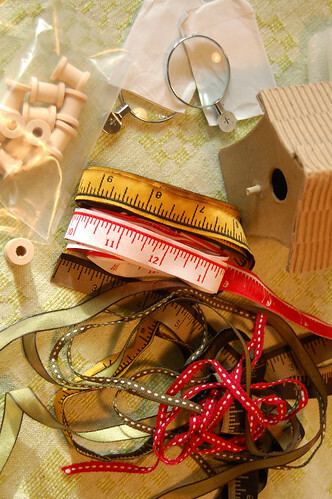 Fun home crafted swedish stuff! Artist Mary Bogdan has just published a book about her art. I want this book! 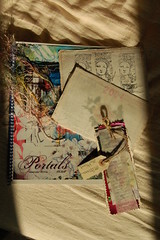 This entry was posted in Inspiration, Mail bliss, Pretty things. Bookmark the permalink. Nice things! The dish cloth was really cute! 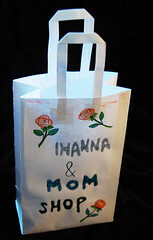 “Ihanna & Mum Shop” – how absolutely cute! And you should know, I?m very happy for the outcome of our swap too, your pink and rosy papers and stuff… Actually some of it is on my desk right now – as part of a collage. Hope to get some time for gluing/sewing it together soon. I?ll blog it then, so you can see it! I loved the “Extreme writting Pens” photograph… you captured it very well .. it reminded me of the colors you see around a city in night time.. very bright and cheerful..
Hanna i really do thing you can make money with the stuff you create.